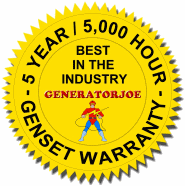 Largest online selection of OEM designed and built Industrial Diesel Generators, Three Phase diesel generators from GeneratorJoe. "Centuron" Three phase diesel generators. 9,000 watts (9 kW) to 175,000 watts (175 kW). 60 Hz or 50 Hz. Engines from Perkins & John Deere.